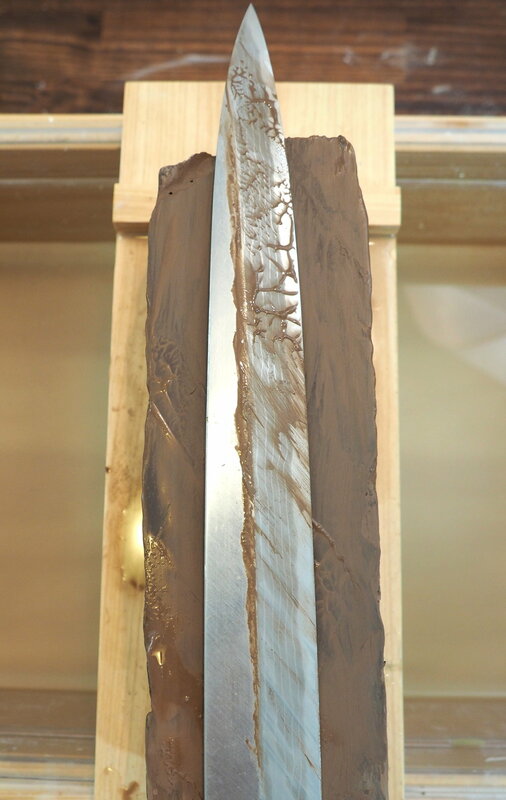 You cannot talk about Japanese knives without talking about Japanese natural stones (tennen toishi). Unfortunately, many people are attracted to sharp and shiny things (ourselves included), and pass over the other half of things (which as you can see, we do not) - the stones needed to sharpen them. Although the synthetic stones of today have made huge strides in consistency and efficacy, professional sharpeners and knife users around the world will never abandon their natural stones. 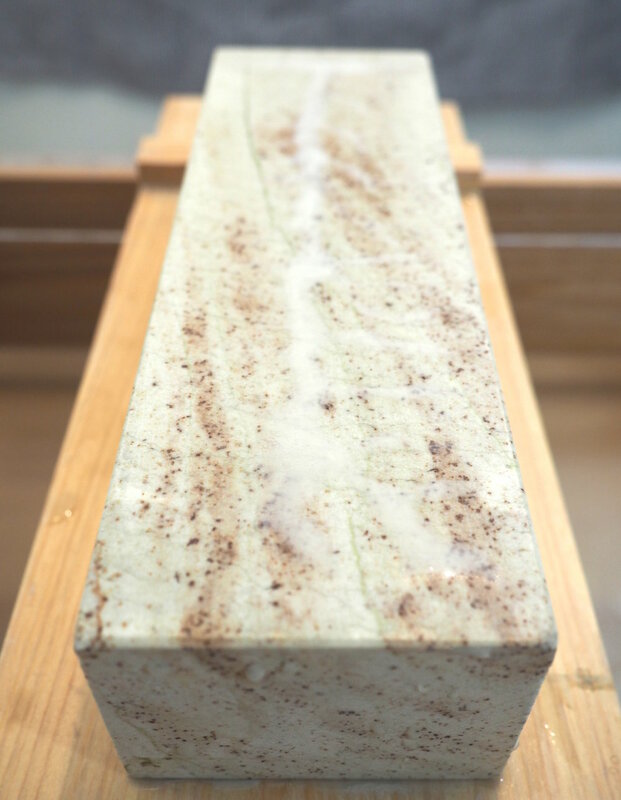 As cheesy as it is to say, using natural stones is like using some gem imbued with magical powers; there is nothing like it. They can be hundreds of millions of years old, look dull all the way to magnificent pieces of abstract art, be incredibly abrasive and soft, to extremely hard and seemingly not abrasive at all. They are snapshots of millenia past, with their own stories and histories. What may explain some interested parties in overlooking tennen toishi is the fact that they are likely the most complicated bunch of whetstones to understand; they no doubt confuse us at times. There are few consolidated and consistent sources of information, and not all definitions and terms are agreed upon. We have done our best to find and use the most common definitions, along with our own, and outline these below, in hopes that you will come to appreciate these simple pieces of rock taken straight from the Earth itself. Although there are many ways to talk about and define tennen toishi, it is often easiest for beginners to get a sense of them by simply undertstanding their grit ranges (which they themselves are not always agreed upon where one grit ‘class’ ends and another begins). These grit ranges are ‘ara-toishi’, which we define as coarse as can be - 1000 grit; ‘‘naka-toishi,” which we define as 1000 - 5000 (some stop at 3000, but we feel this creates an imbalance in the amount of stones defined as naka-to vs shiage-to); and “shiage-toishi,” which we define as 5000+ grit. Some further classify “awesado,” or “finishing stone” as an additional class; one that is even finer grit than shiage-to, and is mainly mentioned when discussing razor and tool sharpening. For knives, however, we stop at shiage-to. It is important to note that since tennen toishi are “natural stones,” all grit estimations are approximate, as opppossed to synthetic stones, which are virtually at the grit they are sold at eg, 2000 grit, because they are man-made in controlled environments. It is only with getting your hands on different stones of differing grits can you start estimating grits on natural stones. Each grit range has its uses, and with enough exposure, you will consistently start to find certain stones from certain strata (Sō) falling within these grit classes, although there is certainly overlap. Although it is more important to find a stone that works for your needs and preferences regardless of where it is from, or how it looks, it can be very helpful to understand how they are defined, as stones from different mines, strata, colors, and patterns are thought by many to be superior in one way or another than others, and create high demand, and thus prices, for certains stones. So if you are on the market for tennen toishi, it can pay off to know what you are looking for, and how to talk about it. We touch on such below. How are tennen toishi defined? Strata, which is where we take our name from, are layers of rock that contain certain ‘classes’ of stones. Within these strata there can be even dozens of ‘veins’ or ‘seams’ running through each strata that are subtly different from each other, typically in appearance but also possibly sharpening characteristics such as hardness and fineness, and further define the stones’ names. As is the Japanese way, each aesthetic quality, from color eg. kitta (yellow), asagi (light yellow), habutae (“fine silk” used to describe very white suita), to patterns on the stones eg. kan (ring pattern), karasu (crow pattern), namazu (catfish pattern), etc, have their own words, which further help classify them and suggest possible cutting characteristics. These definitions can easily seem overwhelming, but once you understand the terms/definitions, you can begin to see their utility when dicussing, purchasing, or using tennen toishi. The mountain, or mine, along with the strata, and the subtle differences exhibited by different veins within those strata, are typically where the stones get their names. Strata are organized into 3 larger “Naori” (montain geology) groups (Naori are sometimes called the strata, while what we call strata, the layers within the naori, are sometimes called (from coarsest to finest): “Ai ishi naori”; “Hon kuchi naori”; and “Chu ishi naori,” although these larger classes are rarely mentioned. The strata within these naori are defined by their sequential depth within the mine, and the types of stones they contain. 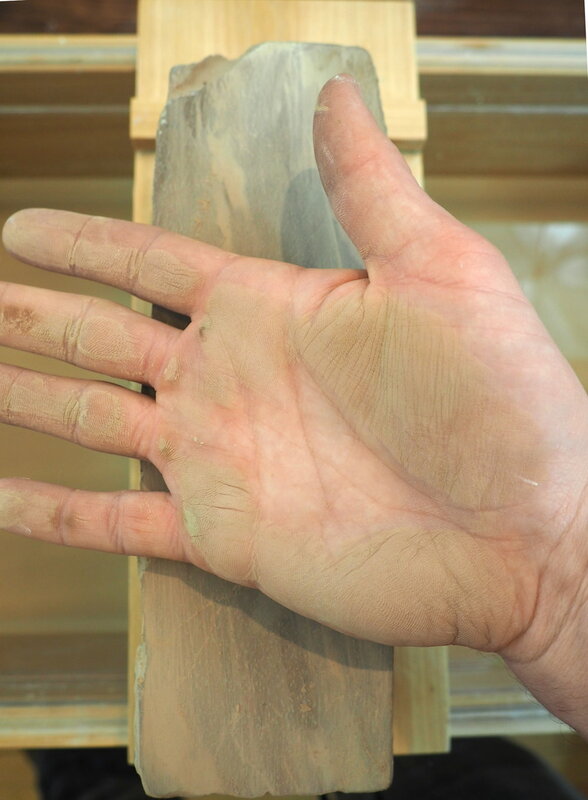 Going the strata route to understand and discuss tennen toishi can be helpful once you have had a decent amount of experience with tennen toishi, but easily overwhelming for beginners, thus why we have organized our stones within grit classes instead. Here is an example of a lenghty stone name: ‘Nakayama kitta kan sunashi Maruka hon suita Lvl 5+/9.5’. The breakdown is as follows: stones are defined by the location or quarry where they were mined, eg. Nakayama; their color if notable, eg. kiita (stark yellow); pattern or aesthetic attribute, eg. kan (circle pattern), sunashi (absence of small holes typically found in suita layers); possibly mark of tested quality, eg. Maruka (a stamp of superior quality used by a famous past owner of the Nakayama mine),;strata, eg. hon suita; hardness, eg. Lvl 5+,;and sometimes fineness of the abrasive particles, eg, 9.5. So here we have a yellow stone with a ring pattern on it, no small holes despite it being from a suita strata, that was mined in Nakayama, that has been tested and marked as being a prime stone, that is very hard, and has very fine abrasive particles. Wow, isn’t that a mouthful? Thankfully, such a lengthy title isn’t always used, this is simply an extreme example to illustrate the depth of defining tennen toishi. Sometimes just the mine is used, sometimes just the mine, color and strata, etc. Because some colors and patterns are found only in certain strata, it can be redundant to list both, so only one or the other may be listed, making things a little easier to read. Although this example has a quality stamp designation, many stones do not, and the absence of one does not indicate that it is an inferior stone. It should be noted that the orders of the terms, color, pattern, strata, even mine order can be interchangable depending on who writes it, so you should try not to get too caught up in the order of words. Funny enough, as mentioned earlier, the location and type of stone, etc can impact its price, and this Nakayama kiita example is one of the most sought after tennen toishi in the world, and can sell for thousands of dollars depending on its condition. Users can stop at any grit range they want depending on what type of results they are trying to attain. 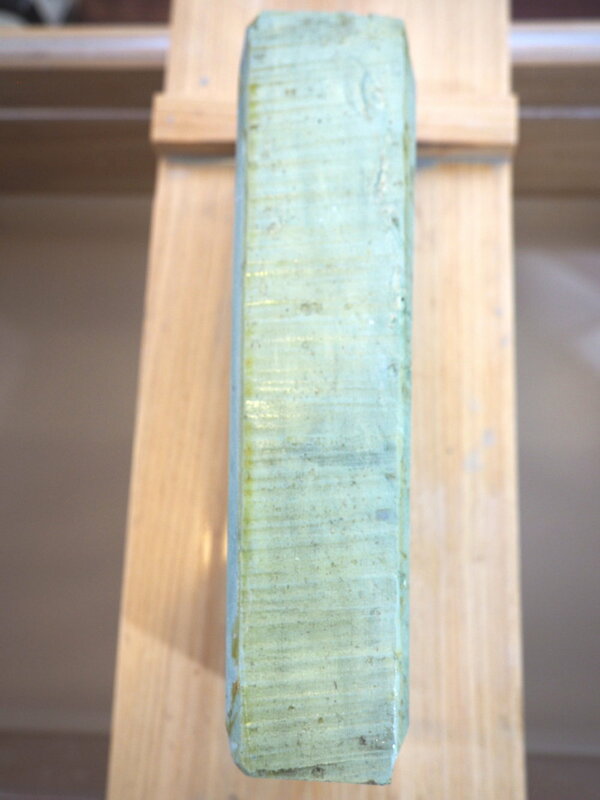 If you want set bevels or leave very toothy edges, you are probably going to use ara-toishi, with most stones coming from strata within the Ai ishi naori; or if you want an very keen edge, you are probably going to use stones in the shiage-to grit range, with most of the stones originating from strata in the deeper Hon kuchi or Chu ishi naori groups, or if you want a ‘balanced’ edge, you might use stones in the naka-to range, with most of them coming from strata within the Hon kuchi naori. 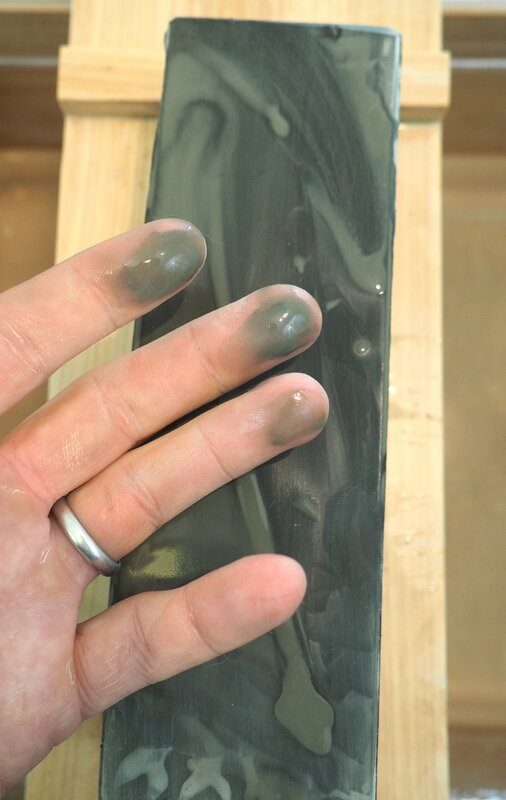 Why are Japanese whetstone so unique? What makes Japan’s stones so unique and famous is its unique geography and tectonic history. Japan is an island nation located on the infamous “ring of fire” tectonic plate boundries, and there is a lot of intersecting tectonic plates creating fascinating geological features. Honshu, Japan’s largest and central island, produce the most well known tennen toishi at many of its countless mountains, especially around Mt. Atago (Atagoyama) near Kyoto. The earliest known use of what we would define as tennen toishi used today, were dated back to possibly 1190, but certainly during early 1200s, which is even before proper smelting techniques hit the scene in Japan. The unique, mainly sedimenatry layer of stone that is below layers of vegetation and unusable rock for sharpening in the area of Kyoto around Atagoyama is called the ‘tamba terrane’, and ‘ultra tamba terrane,’ and they began their formation around 225 million years ago. A terrane is an area of land on or around a fault boundry with its own unique geological history and stratigraphy. The terranes were formed mainly from metamorphic sedimentary deposits of topsoil, clay, silica, and radialaria. 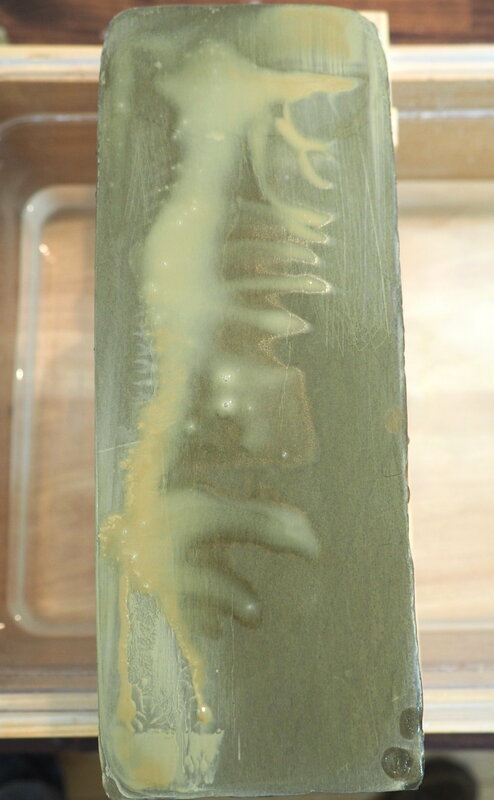 Radialaria were prehistoric crustaceons whose exoskelletons were rich in silica, and are also the main color source in renge patterns. Silica is important because it is the main abrasive particle in tennen toishi (and many other natural stones around the world, and the 4th most abundant mineral in the earth’s crust). The terranes sat ontop of the Pacific tectonic plate for millions and millions of years, building up more sediment, and undergoing metamorphism under pressure, heat, and other natural elements. After the Pacific plate hit, and started moving under the Asian plate, the terranes were essentially scraped off the Pacific plate, and moved over the solid bedrock which was forming into the mountains and valleys that are now present day Honshu, and settling around present day Kyoto. There are dozens of mines just around Kyoto, not to mention the rest of Japan. Unfortunately almost all of them are now closed, either from depletion, or lack of financial incentive to keep operating them. Not all mines have all the same strata, ie, you cannot expect to go from one mine, start digging, and expect to find they exact number of present strata from another mine from a different mountain or area (these are natural stones, after all). The size/grit/quality of strata can differ from mine to mine around the same mountain or quarry, with some areas being famous for producing specifically high quality stones from certain strata, eg, Nakayama, Shoubudani, Okudo, etc. It is only with reading, discussing, and using a range of different stones from different strata and different mines, that you can begin to grasp the beautiful complexity and understanding of how tennen toishi differ and behave. If you would like to learn more about specific strata, please feel free to contact us. 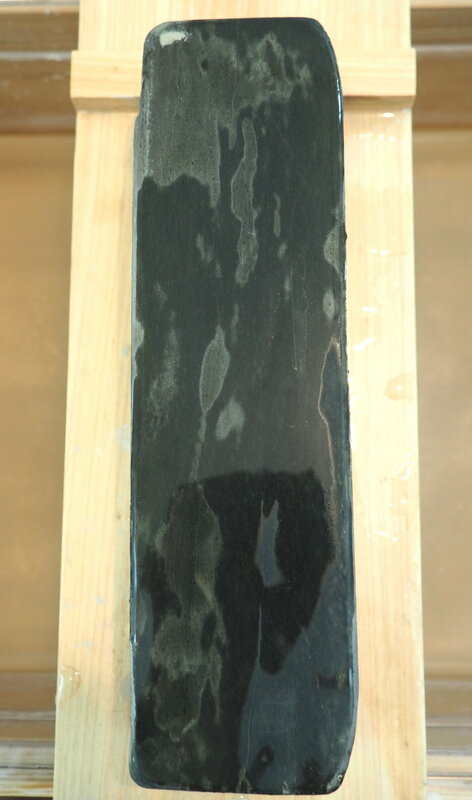 Ara-toishi, or coarse grit stones, are usually top strata (ara-pin) stones, and typically some form of sedimentary sandstone, that are typically used as the first set of stones for dull blades. They typically range from ~300-<1000 grit, and are ideal for chip removal, bevel setting, or even slight profile alterations. Depending on the intended use of the blade, such as butchery or vegetables, some users may even stop sharpening on some of the 'higher' grit ara-toishi and be fully satisfied. Since they are a top layer stone, they are quite porous, very muddy, and efficient, as well as easy to excavate and thus cheap and easily accessible to buyers. 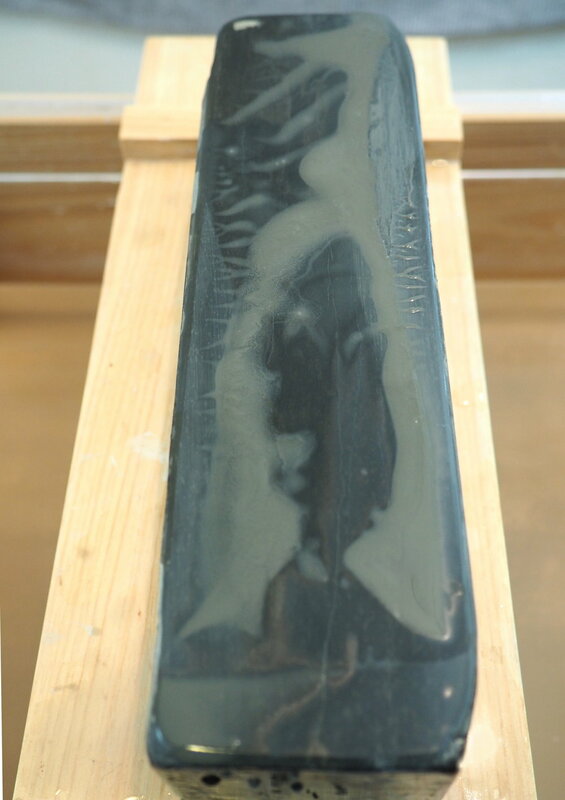 A downside is that could potentially contain toxic inclusions, typically very hard concentrations of quartz (or silicon dioxide), or even 'debris' like pebbles, which could damage a blade during sharpening, thus a reliable source is required to assure that the stones have been inspected and and pass muster that there are no potential toxic inclusions. Synthetic stones have largely replaced ara-toishi given their guaranteed lack of toxic exclusions and set grit levels with very hard abrasive particles, as well as relative affordability. However I have often found quality ara-toishi to dish less and require less lapping (dishing is when the stone erodes slowly from sharpening and needs to be flattened true again by a lapping plate to maintain true angles). Add in the beauty of ara-toishi, and I often find myself reaching for them when I'm doing light repairs or bevel setting on high quality steel. Appearance and texture: Like most Igarashi, this one is at first glance a pretty boring stone. Its chalk white appearance mimics its texture, it’s firm, but not hard, airy but also dense at the same time. This stone has a little goma (sesame seeds) sprinkled throughout. What makes Igarashis so special is the dramatic color change when wet. It goes from that pasty chalk white, to a brilliant almost aquamarine hue. 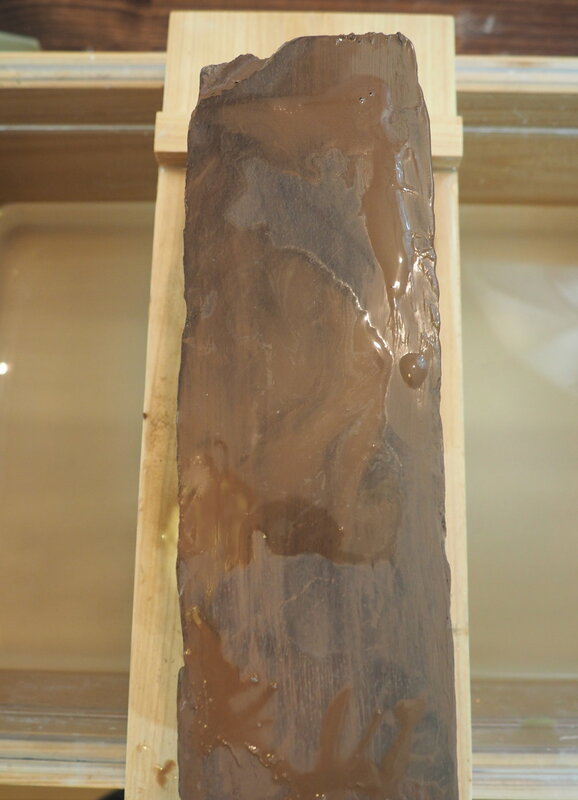 Background: Originally Igarashi were mainly sourced from Kasabori in Sanjo, Niigata, and had a solid reputation as a dependable, efficient stone. Nowadays they are sourced from several different places still around Sanjo, but have lost a little luster in users’ eyes. This Igarashi is likely a newer stone sourced from one of these newer mines, or from a fairly exhausted mine in Kasabori proper, as it isn’t as efficient as my other Igarashi which is an older example from Kasabori, for sure. I’ve designated the Kasabori Igarashi as such to differentiate from newer Igarashi like this one which now are often just called Igarashi, with no designation. Igarashis are a fairly abundant stone. Often sold as a ‘beginners’ stone (and was indeed one of my first tennen toishi), as it’s an approachable and affordable stone. Typically specced at around 1-2k grit, it yields a fairly toothy finish. Some users use it for a kasumi finish, or even use it to create or refine small bevels. I do not find this stone to be nearly aggressive enough for such relatively heavy removal, and use it exclusively for toothier edges. Igarashis can often require the consistent addition of water during the sharpening process to keep it from getting too dry, and this is one of the few tennen toishi that I actually fully submerge in water for a couple minutes prior to use. 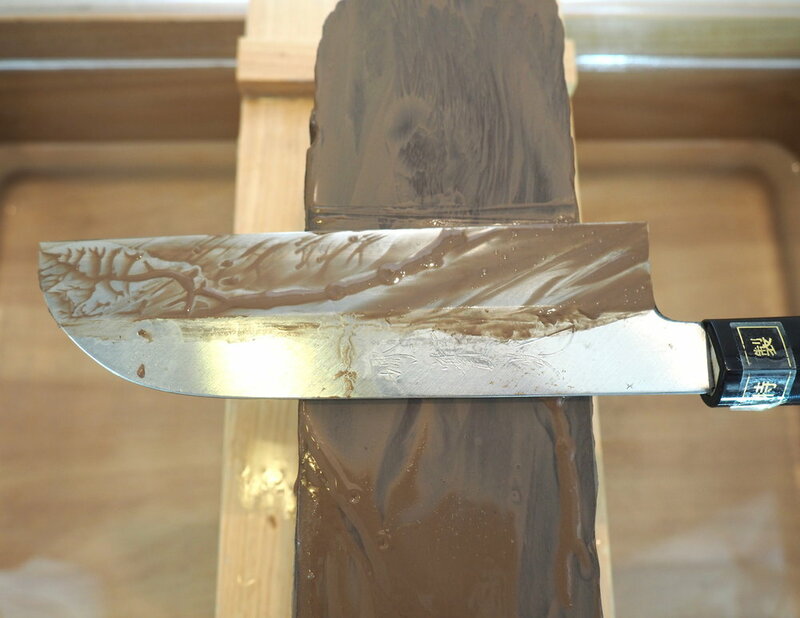 If it dries out, it becomes much less efficient, and often causes the blade to skate. Working up a slurry with a diamond plate helps, but it too can dry out, which is why I like to saturate it before use and then whip up a slurry with a plate. Stainless Steel (SS): This igarashi and SS don’t really get along. The abrasion resistant stainless steel on the Hitohira Hisamoto Inox gyuto I used made for a painstakingly long sharpening session to get the edge back in working order (to be fair, it was duller than I usually start out with, but still). Thankfully the Igarashi is a very approachable stone, so the extra time I spent on the stone was easy enough, and I wasn’t worried about making any mistakes. The feedback is odd. 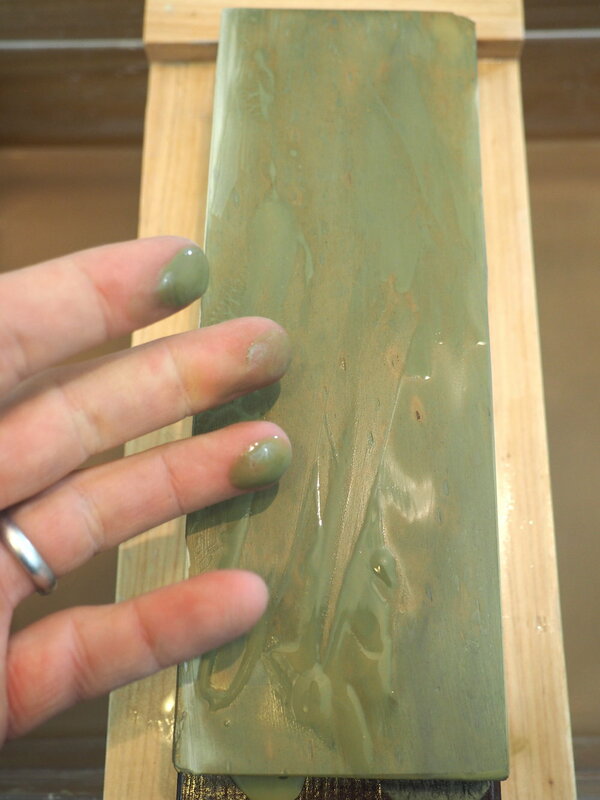 For a lower grit naka-toishi, that some users even use to set small bevels, you would expect some relatively heavy feedback for a stone with such a purpose, but I find this to act like a much harder stone, as it doesn’t give up mud that easily and lacks a lot of feedback. 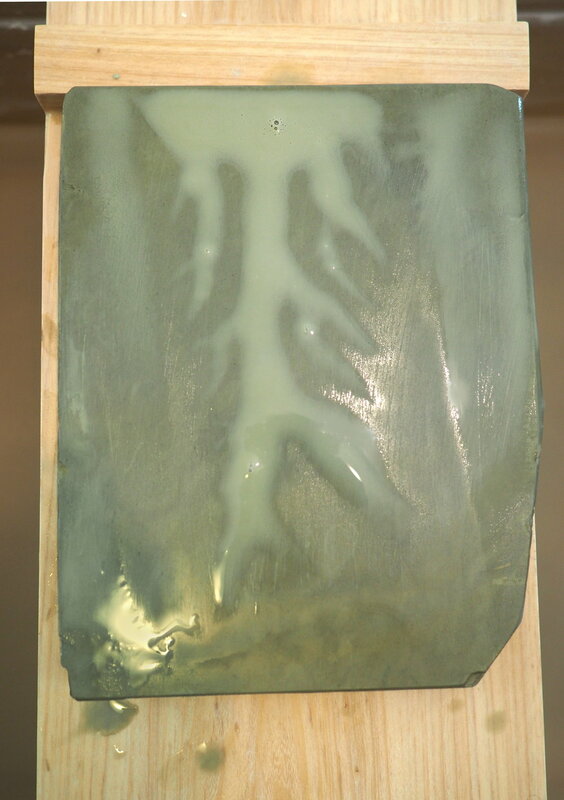 I was able to get past the inefficiency my second time around by soaking the stone as I mentioned previously, thus loosening up the matrix and making the stone a bit softer, and more efficient. The resulting slurry has an interesting pillowy softness to it, like you would imagine crushed up chalk might be like. This softness on top of the firm stone makes for an unusual feedback that I like to go back to every now and then when I want to experience something different feedback-wise. The edge has some teeth, but was a bit keener than a 1k finish, so I’d guess this is closer to 2k, which could also explain why I don’t think this particular stone is ideal for bevel setting. Shirogami: The case of relative inefficiency from the SS session was less of an issue when using my Gesshin Kagekiyo shirogami 2 petty. 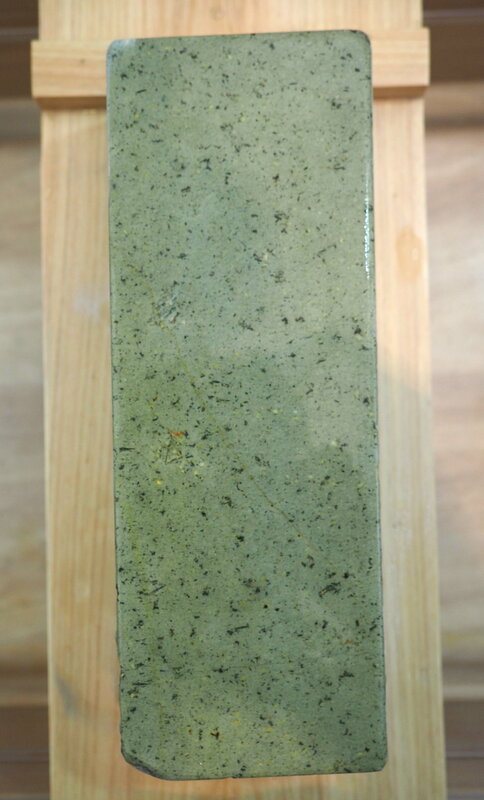 The steel was much more responsive to the stone, and I presoaked before use. 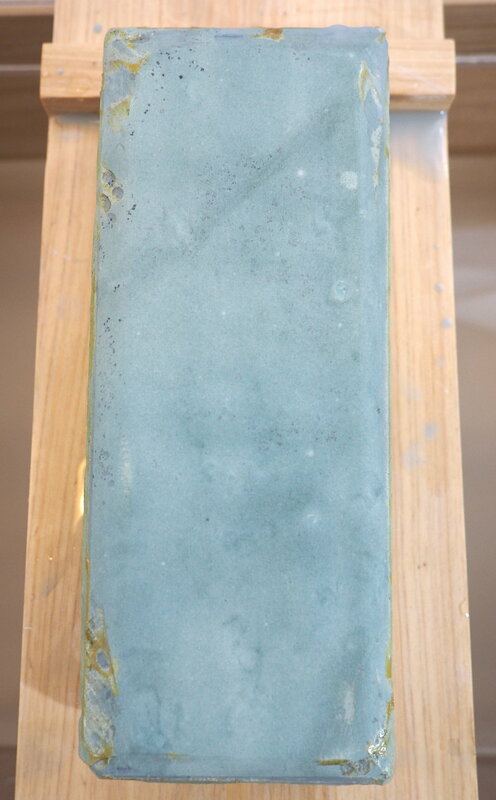 The increase in abrasive particles provided more feedback to the hard steel on the Kagekiyo. I liked the edge a lot more than the edge on the Hisamoto Inox (really mainly a function of the superior steel), and would suggest this for veggie eaters. Aogami: Well, given that I mentioned that it wasn’t a very aggressive 1-2k stone to begin with, the dance of the stone and aogami was pretty slow and boring. I constantly had to watch my water management, and often whip up a slurry to make it more aggressive. If the stainless steel took 5 minutes, this took 10, which is sloooow. That being said, after all the exhaustingly slow dancing was over, the edge was decent; sharper than the stainless, but not as keen as the shirogami, as is usually the story, but lacked the bite that I expect at this grit range. Conclusion: This ‘normal’ Igarashi is, well, pretty average. It’s certainly approachable for the beginner in terms of sharpening experience, as is the affordability and availability. If you’ve got a number of stainless steel knives that you want to practice on, and don’t want to finish the edge quickly, then this is a great option. If you’ve got mainly shirogami knives, than this is a great natural stone to start with, as it will get your knives sharp and do it cheaply and easily. I’d suggest avoiding Igarashis if you pack a lot of aogami, as it’s both unnecessarily laborious and yields on so-so results. The color change alone is almost worth getting this stone, as it blows me away every time. As I mentioned in the intro, my stones aren’t a perfect representative for all stones of the same type, but I simply can’t imagine setting bevels on this as some sharpeners have said they’ve done. You’re much better off getting an Omura or Natsuya, which are even cheaper than Igarashis if you want to set bevels with a natural stone. All that said, if you’re interested in getting your hands dirty with natural stones, but don’t want to spend a ton, have stainless steel or shirogami knives, and like a 1-2k finish, then definitely consider an Igarashi.